If you've forgotten about 89.3 KPCC's radio series about the history of the Dodgers, like I had, then go ahead and check them out. They are up to Part 5. Above is the helicopter Walter O'Malley used to flu over Chavez Ravine. On May 2, 1957, Dodger owner Walter O'Malley takes a 50-minute helicopter ride to view prospective sites for Dodger Stadium. 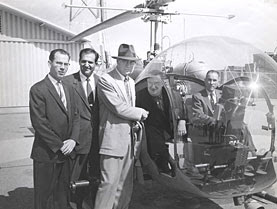 From left is Los Angeles County Supervisor Kenneth Hahn; Undersheriff Peter Pitchess; Del Webb, co-owner of the New York Yankees; O'Malley; and pilot Capt. Sewell Griggers at Biscailuz Center. Only O'Malley and Capt. Griggers took the helicopter ride over the Los Angeles area in the two-seat Sheriff's helicopter. It was only O'Malley's third visit to Los Angeles.